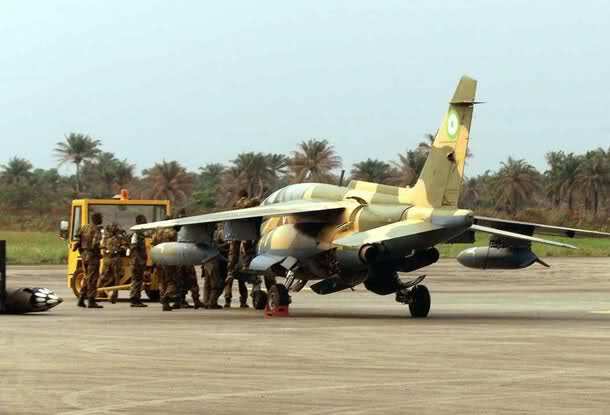 Between September and December 1990, the four Alpha jets deployed by the NAF in support of ECOMOG operations in Liberia were equipped with 30mm cannons, 68mm High Explosive and Armour-Piercing rockets. * During the 3rd week of November 1990, ships that were offloading cargo were sunk at Buchanan seaport while ammunition dumps and oil installations were destroyed. 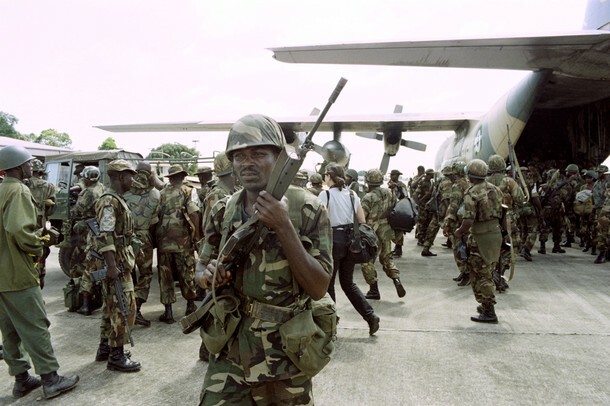 On 15th October 1992, NPFL rebels broke the Ceasefire Agreement and launched an offensive on Monrovia code-name ‘Operation Octopus’ aimed at completely rooting out ECOMOG Forces from Monrovia. According to the then Field Commander, Maj General Tunji Olurin, while reflecting on the situation, observed with satisfaction that ‘but for my darling NAF,the situation in Liberia today would have been different’. The ECOMOG Air Detachment was redesignated ECOMOG AIR TASK FORCE(EATF) with the Task Force Commander now directly responsible to the ECOMOG Field Commander. The Beluga cluster, penetration and general purpose bombs of various sizes in addition to existing rockets and cannons was used to equip the Force comprising six(6) Alpha Jets. Intelligence reports comfirmed that the NPFL had acquired ZSU Shilka self-propelled anti-aircraft artillery, radar guided rapid-fire machine guns and short-range surface-to-air missiles. During the first week, 33 close air support sorties were launched using the area advantage and the overwhelming firepower of the Beluga cluster bomb was generously employed to inflict heavy casualties on the enemy, beating back the rebels at Caldwell,Somalia Drive, Samuka Junction,Gardnersville and Wood Camp. The NPFL trenches and gun emplacements were fished out and attacked with rockets at Johnsonville and Mount Barclay area. As the intensity of the air raids increased, search and destroy recce missions were sustained to make life even more unbearable for the rebels until the capture of Robertsfield International Airport and Kakata, with the roads from Monrovia to Kakata and from Monrovia to Harbel littered with destroyed enemy trucks and light vehicles which fell victim to NAF fighter jets on recce missions. Initially, all Alpha Jet missions were conducted in daylight. The rebels later resorted almost completely to nocturnal activities causing unacceptable casualties to ECOMOG troops, hence the need for A-Jets to conduct some form of night activity into the battle area in order to check the NPFL nocturnal confidence. The Alpha jet is not designed for night attack roles as the basic navigation equipment onboard depends on information from ground stations which were not usually operated on 24-hour basis. Nevertheless it was decided to give night operations a trial. Safe parameters and procedures to govern night weapon delivery on the A-jet were established and this was incorporated into NAF A-jet recurrency programme and shortly after,a few of the “most experienced fighter pilots were cleared to undertake night attack missions. The first of these attacks was at Caldwell base during the battle for Monrovia. Also night attacks were conducted at Gardnersville and Samuka Junction and vehicle convoys were also attacked at Harbel and Gbanga, making life unbearable for the rebels day and night. The 70km advance to Buchanan from Robertsfield International Airport and its eventual capture in April 1993 is reported by Group Captain Gana to have presented most of tactical problems encountered in a conventional operation. The A-jets prevented the NPFL not just from placing huge obstacles along the roads but also from blowing up the bridges en route. One significant achievement of the fighters in this advance was the prevention of the demolition of Saint Johns River Bridge. This 100-meter long bridge was observed from the air to have been loaded with high explosives in preparation for demolition on the night of 31 March 1993. The successful march to Buchanan depended on the use of this bridge,so the A-jets quickly established a combat air patrol(CAP) over it as early as 0500hrs. All attempted movement towards the bridge by rebels on the ground in a bid to detonate the explosives were promptly checked by heavy cannon fire from the fighters overhead until ECOMOG troops arrived and crossed safely after the bridge had been demined by NA Engineers. Buchanan town was already deserted by rebels before its capture, due to A-jets raids on their positions. – Notorious border posts along the border with Cote D’Ivoire particularly the one at Loguatou. At the end of the interdiction missions, 6 merchant ships and several boats were destroyed.NPFL military and economic activities were almost paralysed. It was time for Taylor to once again agree to a ceasefire conference. These achievements were fortunately without Air Force casualty. The fighters flew well over 1000 combat sorties and the rebels could not bring down one aircraft. However, some jets sustained airframe damage from high calibre machine guns but none of the heat-seeking surface-to-air missiles from the rebels found its target. This entry was posted in AFRICAN ARMED FORCES, ARMED CONFLICT, COUNTERINSURGENCY OPERATIONS, GLOBAL DEFENCE NEWS, GULF OF GUINEA, LIBERIA, MARITIME SAFETY AND SECURITY, MILITARY HARDWARE, MILITARY PHOTOS, NIGERIA, NIGERIAN AIR FORCE, NIGERIAN ARMED FORCES, NIGERIAN MILITARY HISTORY, RISK ANALYSIS, SECURITY ISSUES AND CONCERNS, TERRORISM, URBAN GUERRILLA WARFARE, WEST AFRICAN STANDBY FORCE and tagged ALPHA JET, COUNTERINSURGENCY OPERATIONS, ECOMOG, GEOPOLITICS AND STRATEGIC STUDIES, LIBERIAN CIVIL WAR, NIGERIAN AIR FORCE, NIGERIAN ARMED FORCES, NIGERIAN MILITARY HISTORY, URBAN GUERRILLA WARFARE. Bookmark the permalink. I am trying hard to track down a thread in which a man who was part of the team which upgraded the jets left a comment. He was either a German or an Italian. Then, I can ask him questions. On question by sbm, the NAF has rigged the A-jet to better carry the Beluga and Durandal bombs as can be seen in new camps paint, new internal wirings and better pylons, one does not need multifunction displays for their employment. As it is, the A-jet still cannot deliver Precission Guided Munitions (PGMs) nor carry munitions beyond 500kg/pylon. I once said to fellow cybergenerals online that in ten years over Liberia and Sierra Leone(where the Alpha Jet was popularly nicknamed ‘Pa Alpha’ for its decisive CAS roles), the NAF which deployed four Alpha Jets and later on, six Alpha Jets in LBR and seven Alpha Jets at peak deployment in Sierra Leone DID not lose a single aircraft in an entire decade. Someone said they lost only one and that the pilot survived and later instructed at the 99 AWS in Kainji. Well, here comes confirmation again. Well, that is the official and gazetted Nigerian account which you just read. Beyond refutation for the heck of it, what is your own source? You saw where it was culled from. “ZSU Shilka” it said and that is a quad-barreled self-propelled system. It does not preclude the fact that they owned ZU-23-2 towed AA guns and I have seen truck-mounted 14.5mm AA guns in certain photos and documentaries myself. Concerning the destruction of a Shilka which happened in Sierra Leone during an ambush by a combo of Ukrainian mercs and SLR renegade troops and rebels, I do not have to rely on official accounts for that having PERSONALLY interviewed a Major, a senior Captain and a NCO in 2006 who were in Liberia and SLR between 1997 and 2000. This is a wonderful and long overdue piece. The use of the the Alphas in this CAS role may be unique in the type’s history. That it was done and done effectively is testimony to the skill of the aircrew. The other point of note is that the strikes were done in the face of a relatively potent AAA environment. You are right, SBM. Long time, my man. How is it going out there in beautiful Trinidad? That was the reason why we posted. Sometimes, it scares me how the Nigerian military throw a needless veil of secrecy on otherwise rigorous operations which should make banner headlines. The NAF were even more active in Sierra Leone, so you can imagine the total number of sorties flown during the ECOMOG operations in both countries could be over 3,500! Yet what do we have? The NAF have such edifying content but prefer to post photos of NAFOWA on their website. If we do not tell our story, who will? and see how blank it is for a national armed forces which has been engaged in combat operations non-stop since August 1990! Who else to blame but ourselves? Even our own Peccavi here once said that he read an assessment of the ECOMOG air operations and was surprised to see how highly the Westerner who did the assessment spoke of the NAF. Yet our own people keep mum over the most powerful weapons needed to clear doubts. Na wa. It is baffling..everything is coded, coded but they read about Iraq and Afghanistan, Gulf War, Iran-Iraq War. Who then would tell our story? Imagine all those many sorties flown by Hind attack helicopter pilots in the Niger Delta between 2006 and 2009 – no details, no records. Best efforts glossed over. Ogas Beeg and gbash10, make una start the weekend early with one crate on us. Well done for this, It gladdens my soul! Mr. Beegeagle, I thank God for your determination to continue to present a more 3 dimensional picture of our armed forces. I get exasperated every now and then, but this blog keeps me believing that the dam of ignorance, and unnecessary information black outs, is about to bust. I happened upon some members of our security forces here on training. I told them to spread the word about beegeagle’s blog amongst their fellow officers. They need to participate and contribute more substantially to the discussions on this blog. Great excerpts from NAF’s liberian exploits. We need MORE !! more video footage, more 1st hand accounts, more pictures. Well done Oga Xnurr44, this is the most detail on NAF operations, one has ever gotten. More grease to your elbows. perhaps you can convince some of your colleges to share the details(de classified that is) of their experience. God bless you, gentlemen. We go dey try. Tis our duty. Indeed and in truth, the labours of our heroes past shall NEVER be in vain. Amen. @Peccavi. One crate of Big Stout na twelve bottles o – six for Gbash10 and six for yours truly. You wan mek we condemn..lol? Its all in a good cause! WEST African peacekeeping forces and Liberian soldiers are fighting to repel a rebel attack on this damaged capital as tens of thousands of war-weary refugees flood the city’s relief centers and hospitals. Thundering explosions have rocked the city as Nigerian Alpha jets bomb the swamps in the northern section to drive out soldiers of rebel leader Charles Taylor’s National Patriotic Front of Liberia (NPFL). The capital’s airport was closed yesterday because of heavy fighting, and there were reports of several casualties. The NPFL offensive marks the worst fighting in two years, returning the divided nation to war and aggravating the region’s worst security crisis. More than 150,000 refugees have fled to central Monrovia since the fighting began, carrying children and possessions in wheelbarrows and ontheir backs. Water supplies have been cut off. A curfew is in effect between 6 p.m. and 8 a.m.
Fighting was also reported in Gbarnga, site of Mr. Taylor’s headquarters, and the rebel-held port of Buchanan. The peacekeeping forces, sent to Liberia two years ago by the 16-nation Economic Community of West African States to impose a cease-fire, now find themselves drawn into a full-scale military conflict. ECOWAS leaders met in Cotonou, Benin, last week and called for a cease-fire by midnight last Wednesday: Taylor has ignored this. The West Africans are to meet again Friday in Abuja, Nigeria, to discuss a possible UN role in resolving the conflict. They also have threatened a land, sea, and air embargo on Liberia if the fighting does not stop by Nov. 6. Liberia’s crisis began in late 1989, when Taylor led a small band of rebels on a series of raids against northeastern villages. The attacks soon focused on members of President Samuel Doe’s ethnic group. By July 1990, the tribal conflict had spread to the capital. A second rebel group led by Prince Yormic Johnson captured Monrovia on July 23. In response, ECOWAS sent 4,000 peacekeepers, known as ECOMOG troops, to Liberia in August of that year to disarm the rebel factions and pave the way for national elections. Doe was killed by Prince Johnson’s group in September 1990, and ECOMOG was left to mediate between the two rebel groups and the Armed Forces of Liberia (AFL). Johnson supported the West African intervention; Taylor, who was driven from the capital, has strongly opposed ECOMOG. Prospects for peace seem dim. Momolou Sirleaf, the foreign minister for Taylor’s shadow government, told a press conference in Ivory Coast last week that the NPFL would never disarm to ECOMOG because the peacekeepers hadbecome a warring faction. As fighting has resumed, it has become difficult todistinguish between the peacekeepers, rebel forces of the United Liberation Movement of Democracy for Liberia (ULIMO), which launched an offensive against the NPFL in August, and the AFL. All are fighting against Taylor. It is unclear how many rebels Taylor has fighting for him. Relief workers estimated that more than 1,000 troops attacked Caldwell, a base north of Monrovia. Meanwhile, between 200 and 300 Nigerian soldiers have been arriving daily in Monrovia for the past three weeks as peacekeeping reinforcements, sources say. Another 1,500 are on call in Sierra Leone. Tons of ammunition have been flown in, the sources say. ECOMOG refused to say how many new soldiers have arrived. One month ago, the force numbered between 7,000 and 8,000. Taylor has mainly targeted Nigerian, Sierra Leonean, and Guinean contingents of the peacekeeping force, which also includes soldiers from Senegal, Gambia, Ghana, and Mali. Nigerian President Ibrahim Babangida had been Doe’s personal friend. NPFL invaded Sierra Leone in March 1991 and started the rebellion that eventually brought down President Joseph Momoh. In Guinea, ULIMO trains its rebels along Liberia’s eastern border. Also, the Mandingo tribe that Taylor targeted along with Doe’s Krahns during the war are Muslims of Guinean extraction. Two other countries, Ivory Coast and Burkina Faso, also factor into the Liberia equation. Liberia’s interim president, Amos Sawyer, has alleged that they continue to arm Taylor. Ivorian President Felix Houphouet-Boigny and Burkina Faso’s President Blaise Campaore – who has admitted he sent 400 soldiers to fight alongside Taylor during the civil war, have pledged to cut off all shipments of weapons to Liberia. ULIMO has threatened to invade Ivory Coast unless it stops letting arms through its border. Following eyewitness reports last month that the NPFL massacred dozens of people while pursuing ULIMO, the interim government urged ECOWAS to jump-start the peace process. OF all newspapers to sing the NAF praises it was none other than the London independent. One does not beat one’s chest about war exploits in respect to the dead and of the other side, however it should be said at the time the NAF WAS HEAVILY ENGAGED they were also under sanctions . The F.G . ( especially the NAF should at the very least make a documentary) showing what really happened very few Nigerians outside the military ESTABLISHMENT really knew how crucial a role these chaps played day and night. TAYLOR , was so angry about the havoc that the A- JETS caused and with Nigerians and especially when he found out that they refueled in s/leone He was motivated to cause trouble in s/leone. @Peccavi,one for two of us is too much ooo,thanks man, @ Gen Beeg,Doxiez,Jimmy,Tim,Yagz,SMB and all other CyberGenerals on this Nigerianized Blog! We shall alway tell our own side of the story. Great Patroits,I am some times happy when I recall the aerial display of an Alpha jet and MiG-21 fighter in a 2-ship formation at Maiduguri in April 1989 as part of the activities marking NAF Day celebration,the display was breath taking and exciting to watch! The Alpha jet was flown by the then Wg Cdr Samson Mshelia and a young Flight Lieutenant as his co-pilot that I can’t recall his name again,while the MiG-21 fighter was flown by one Sqn Ldr Abdullahi. Wg Cdr Samson Mshelia was deployed to Liberia as one of the most experienced(TOP GUN) Alpha jet pilots in the NAF at that time;I feel sad that we have lost a TOP GUN and an ECOMOG AIR TASK FORCE VETERAN.He was from Adamawa State. Sometime in 1996-97,after his successful tour of duty from Liberia/Sierra Leone,he Gave Thanks to God at NAF Base Protestant Church,in Makurdi.He was the President of Makurdi Dart Club,he died in a Do-228 aircrash with Col Wase,but can’t recall the exact date. I have also heard about the downed Alpha jet from the Sierra Leonian air operations.The pilot sustain burns,and is believe to have scars all over his body,a well respected officer and pilot who ‘passed through the valley of death’,also an ECOMOG VETERAN!This officer is said to come from a South Western state. Makurdi with his performance,so his colleagues now call him the ‘MAD-DOG’. On the morning of Independence day on reporting to Base,the young pilots were told not to fly to Abuja again to their greatest disappointment and disbelief!Some older NAF pilots did just fly-pass without aerial display on that day.This guy is also from Kogi State, just like the late Wg Cdr Ben Ekele.Maybe he wants to carry his ‘CAP’. If these new breed of fighter pilots that we have now,could have the opportunity of being trained as SU-30/35 fighter pilots with the FG acquiring these birds,no country will mess around with us again! Hmn..Mshelia…a hero like Khobe. Colonel Wase died in an air crash in 1996. He was MILAD, Kano at the time. He had a son who was a Lieutenant at the time. He should be a very senior Lt Colonel or a rookie Colonel now. As for NAF Silver Jubilee, I was a small boy then and had just started following military stuff. JJ Rawlings was the Guest of Honour. They went to see a superlative display by Albatros pilots at Kano and then, headed off to Makurdi for the grand finale where a Jaguar simulator was commissioned and MiG 21 pilots did some really dexterous stuff – can’t remember now which of the Diley brothers from Numan in Adamawa State(Khobe’s hometown), Sunday or Martin, both of whom rose to the rank of AVM, displayed on that day. But it was most probably Martin Diley who did. Rawlings sprang to his feet in the face of supersonic flight – come to think of it, the GAF still have never experienced supersonic flight which we plunged into for starters way back in 1967! Anyway, Rawlings said that nowhere else outside Ethiopia had he seen such skillful pilots in Africa. The IBB regime thereafter transferred a squadron of twelve L29s to the GAF, having upgraded to the L39. Those were the days indeed. One question that should be considered – will the NAF expand the ordnance range carried by the Alphas ? Will CMDS be installed ? The fact is that the NAF sees the Alphas as combat assets and not just training aircraft. I don’t know why NAF wouldn’t just replace the damned Alpha jets with the SU-25 frogfoot which is a far better attack jet. 1st off, it is heavily armored, and was meant to be the soviets answer to the US A-10 warthog. Also, it has a much better range, and carries way more ordinance than the light alpha jet. And like the glut of used ex soviet mi-24 attack helicopters, they are plentiful, and dirt cheap. So, NAF needs to give up this alpha jet rubbish, and acquire 2 wings (80 to 100 aircrafts), of the Su-25s.